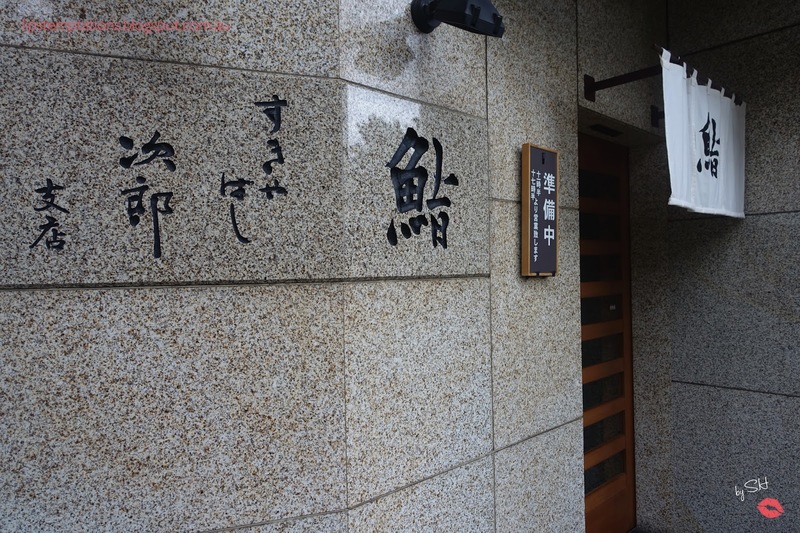 The main restaurant Sukiyabashi Jiro is in Ginza, owned by the famous Jiro Ono from "Jiro Dreams of Sushi" documentary. 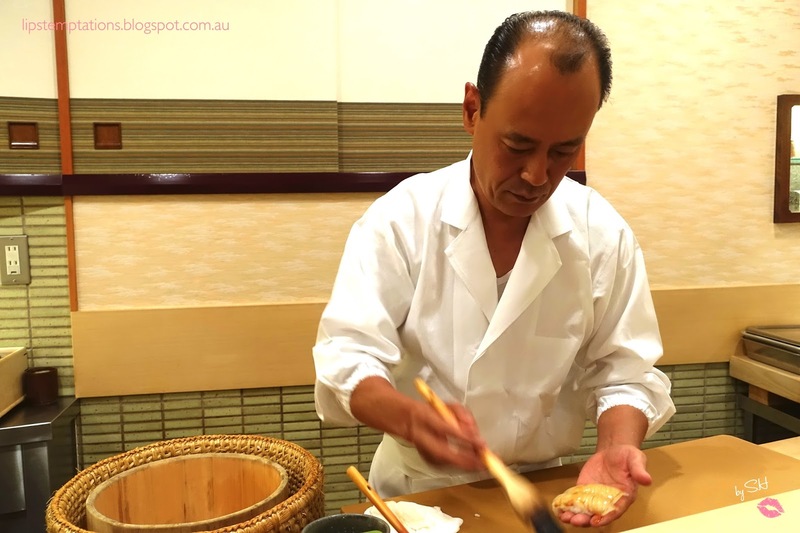 He is famous for his exceptional Sushi with high quality seafoods and currently holding 3 Michelin stars. 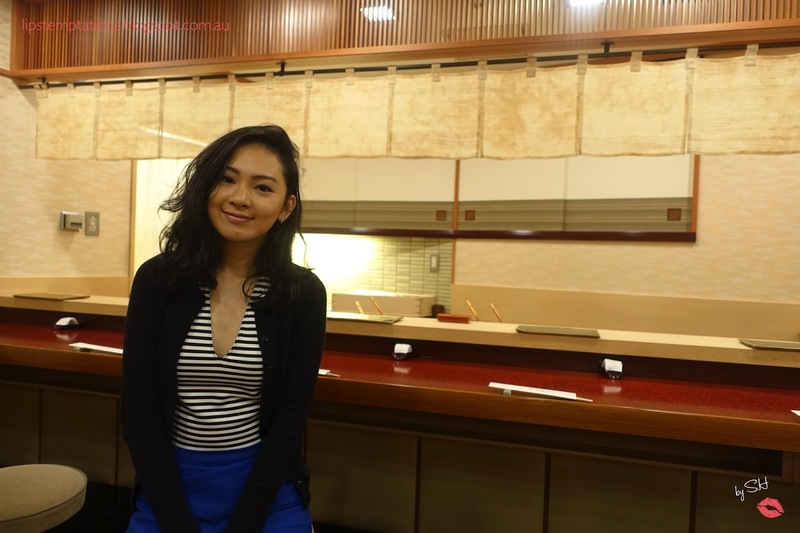 There is no menu as with the most traditional Japanese restaurants and they served sushi omakase (set menu). Another aspect the restaurant is famous for is impossible to get in especially for foreigners. The reservations has to be made in Japanese with a Japanese address, Japanese number and none hotel concierge bookings. 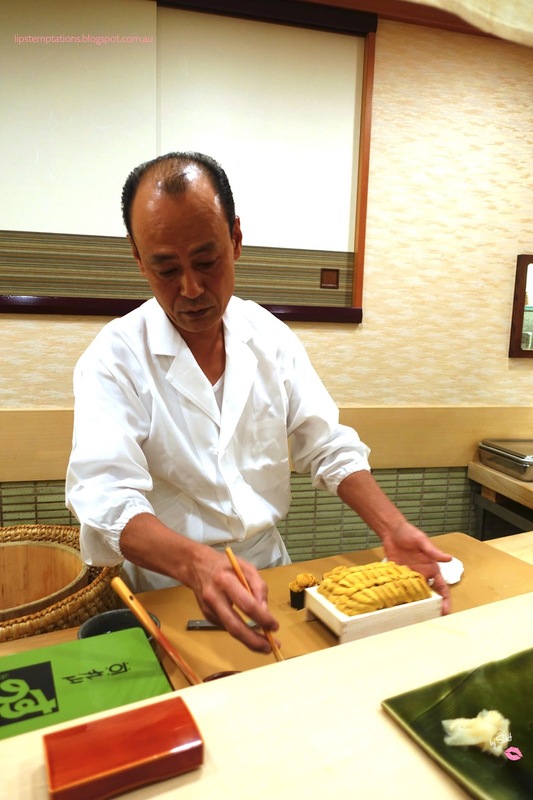 Sukiyabashi Jiro takes reservations of the first of each month for the following month and always books up soon after. I tried and sadly failed. I decided to try to get a reservations for the second restaurant Sukiyabashi Jiro in Roppongi Hills run by the Jiro Ono second son, Takashi and currently holds 2 Michelin stars. Lucky me, out of all days I stayed they have one spot left at lunch. I gladly take it and literally have the urge to do my happy dance. Arrived in Japan my perception slightly changed. Sukiyabashi Jiro is not as well known as I thought it would be and known for a good sushi place but arguably not the very best. 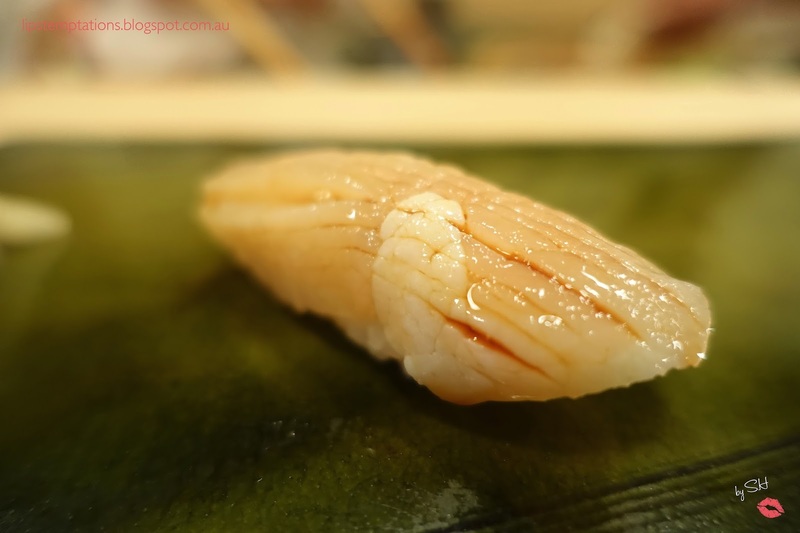 They are well known for the most expensive sushiyas around. Besides all that it still remain my no 1 destination to experience the ultimate sushi omakase adventure. 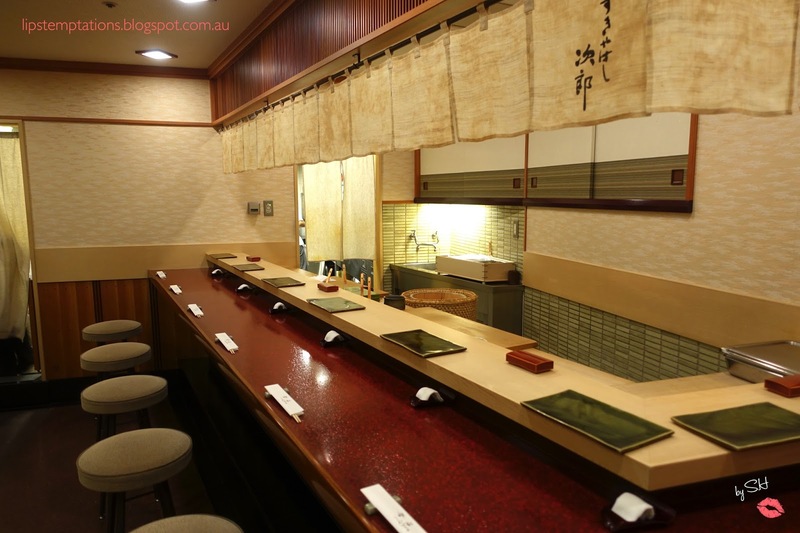 The restaurant itself is humble, Edo style sushi restaurant, all wooden, small with ten counter seats and two tables of four. It was an exact mirror image of the Ginza branch because his father is left handed and Takashi him self is right handed. We are the first one arrived and served cold green tea straight away while waiting for the other customers to arrived. The atmosphere was warm, comfortable and relaxing with a classic music in the background. We got the best seat in the house right in front of Takashi - ono him self. 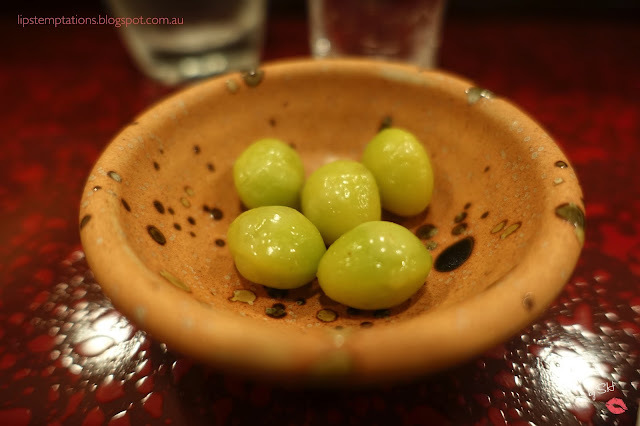 One of his assistant ask us several questions regarding dietary restrictions, all sushi or mixed sashimi sushi lunch, sake or beer and then after the sake was served the show began. There are a couple of rules; do not pick up the plate from the counter, follow the chef instructions on how to eat the sushi (with soy, without soy, with wasabi, just by it self), always lightly dip the fish side down, leaving bits of rice floating in the soy sauce considered bad etiquette, eat each piece as a whole it is considered impolite to bite the sushi in half. Photography is allowed but taking picture of other customers is prohibited. Gingko nuts to start the courses. It was crunchy, sweet and warm. 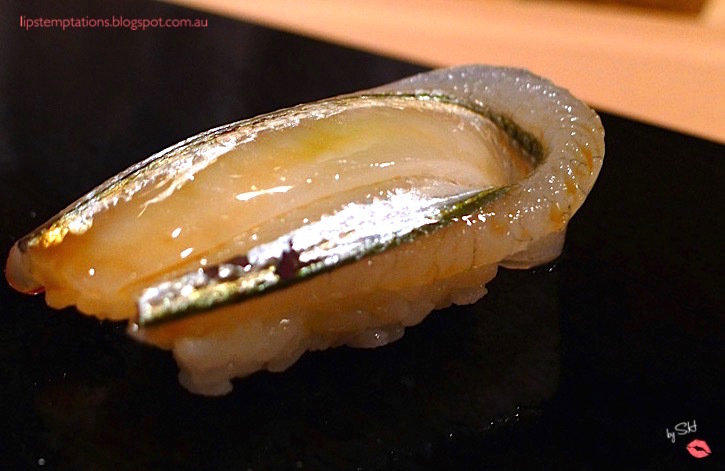 Akagai- Ark Shell Clam Sashimi. Dip lightly with normal soy sauce. I don't normally like clam sashimi but this one is not bad at all. It still has crunchiness not too tough and enjoyable to eat. 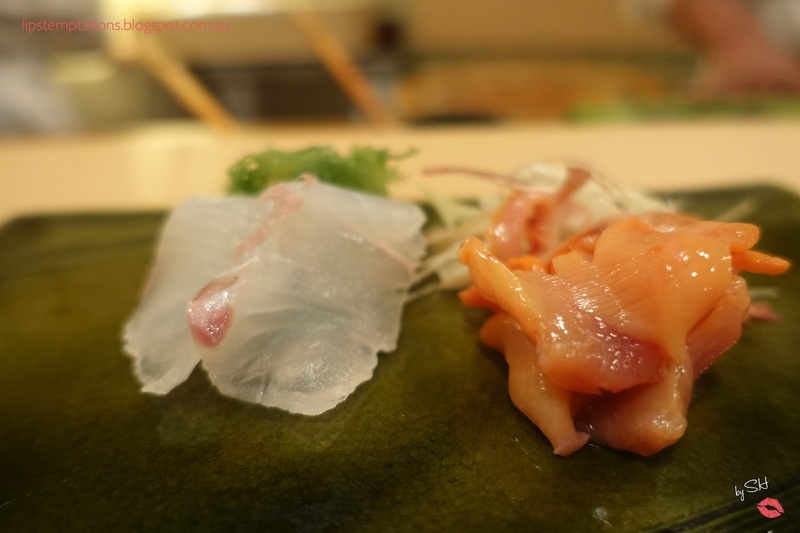 Aji - House Mackarel Sashimi. Dip lightly with normal soy sauce. I usually doesn't eat mackerel but I wanted to experience Sukiyabashi Jiro as a whole and surprisingly it was quiet tasty. Saba- Mackarel sashimi. Dip lightly with ginger soy sauce. 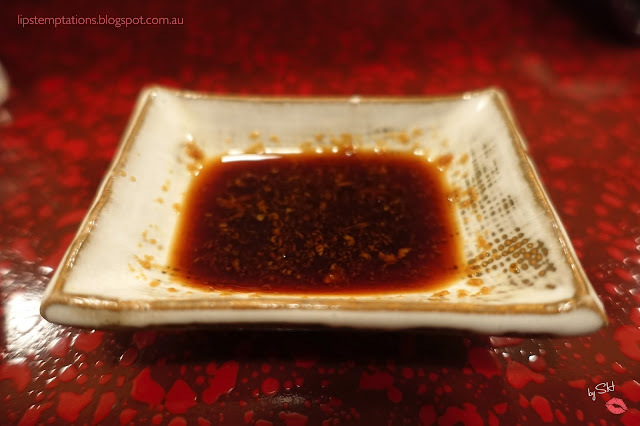 I love the ginger soy sauce, it mixed well with the mackerel and there is no fishy smell at all. 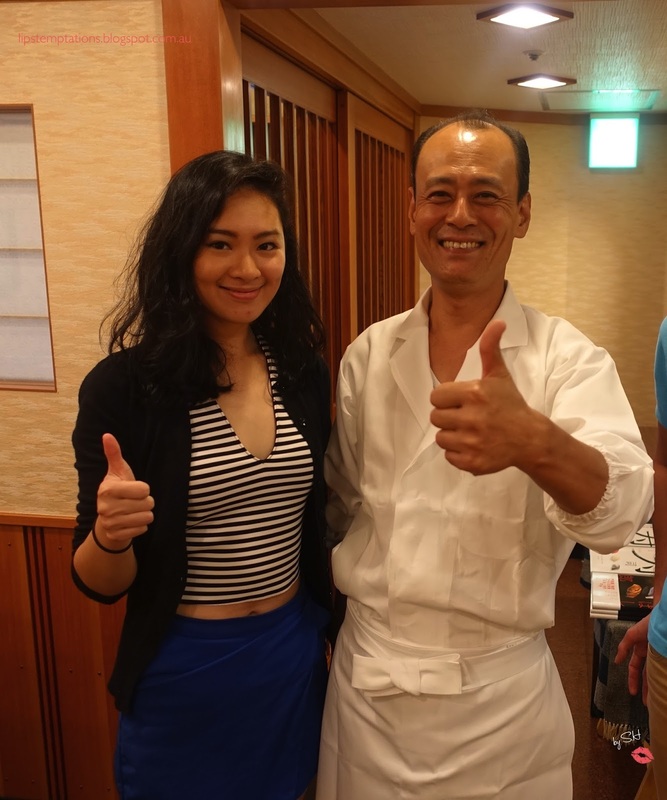 Takashi-Ono is a very friendly person and speak enough Japanese to explain each sushi and how to eat them. Just before he served the Smoked Bonito. He refer to the "Jiro Dreams of Sushi" because this dish is featured in the documentary. 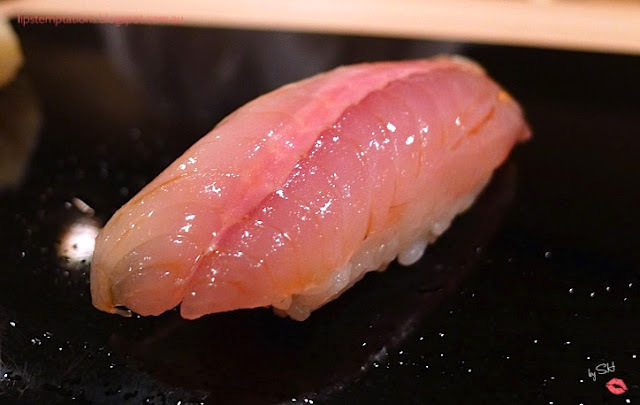 Bonito is related to tuna. 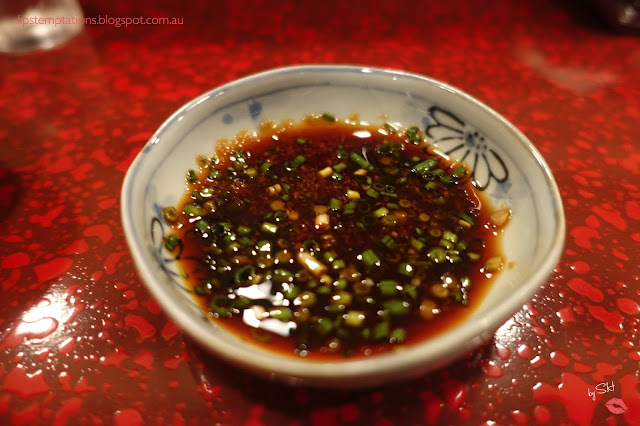 Dip lightly with leaves soy sauce The smoked bonito has a great smokiness and rich body. 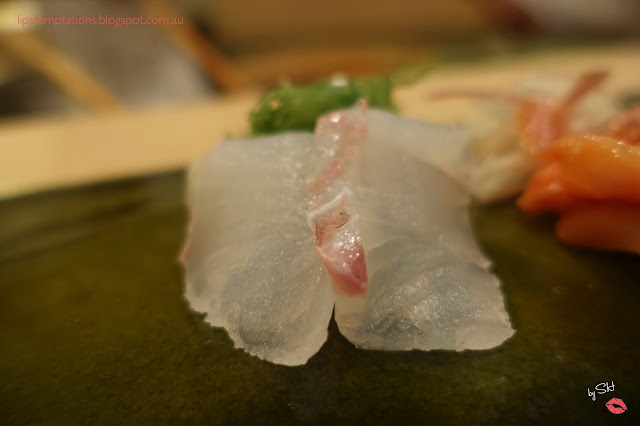 Hirame - Flounder sushi. 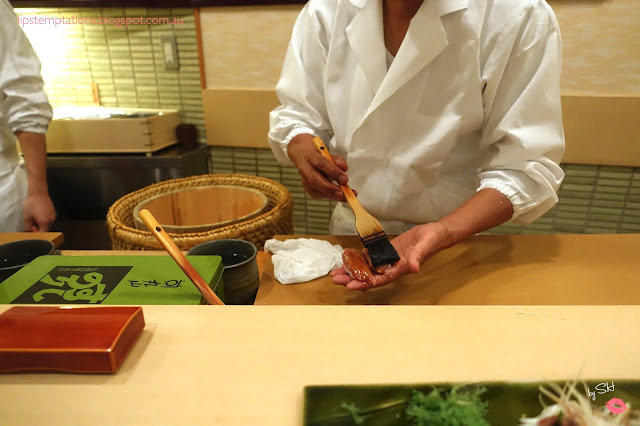 Takashi-Ono used a small brush and glazed it with soy sauce. The way he do it, it's almost like an art performance. 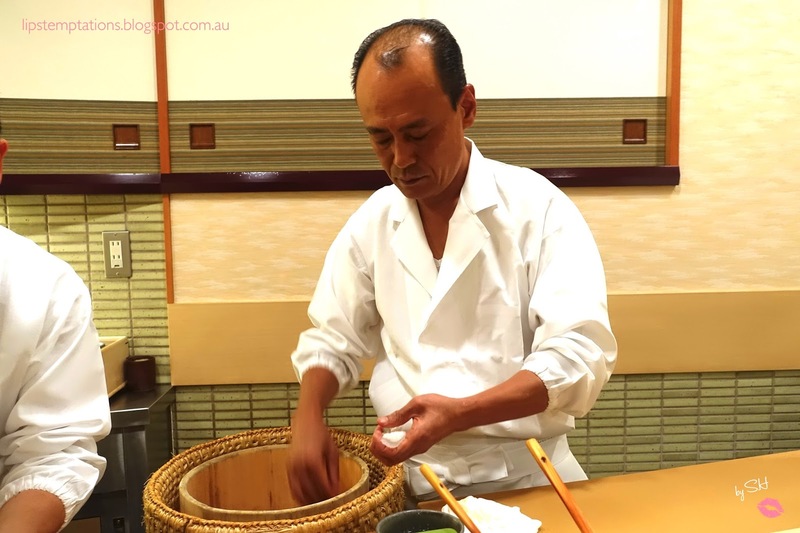 He looks so natural, talking and telling stories while slicing the fish, preparing the rice. Sumi Ika - Baby squid sushi. After a couple of our first courses, we realised the quality of the fish we were experiencing was above anything I have ever eaten before. The baby squid has a pearly shine to it and was prepared beautifully. Before they served the sushi, they show the big clams to provide a visual knowledge of how big is the scallop compared to the regular scallop. Hotate - Big scallop sushi. 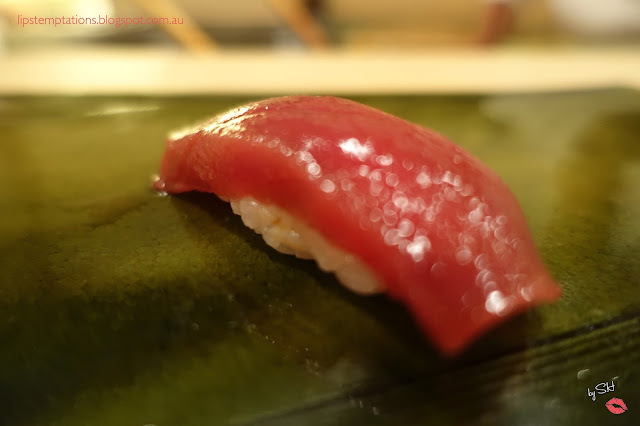 Akami no maguro - Lean tuna sushi. 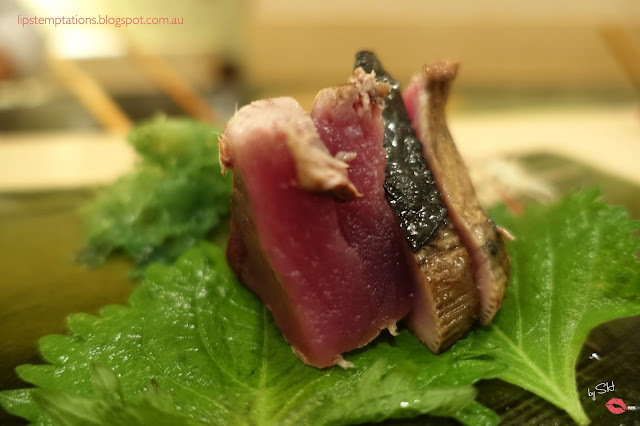 Tuna is a big thing in Japan, almost all Japanese fine dining restaurant served tuna. Chu toro - Medium fat tuna sushi. Takashi-Ono him self explains and showed us all three grades of toro. These cuts of tuna definitely melts in your mouth. Kohada- Japanese sardin sushi. It was marinated in soy and they taste like mackerel. During this lunch I gained so much knowledge regarding sushi and fishes they used to make sushi. By this time I was starting to feeling full and Takashi-ono notice that and offer to make smaller rice for me. I was amaze by his ability to read people and his consideration. He even jokes that the restaurant opens tomorrow if I'm feeling too full. Guida crab sushi. Aji - House mackarel (No marinate) sushi. By this time Takashi-ono still jokes around and show me how small the rice he made for me compare to the regular rice. 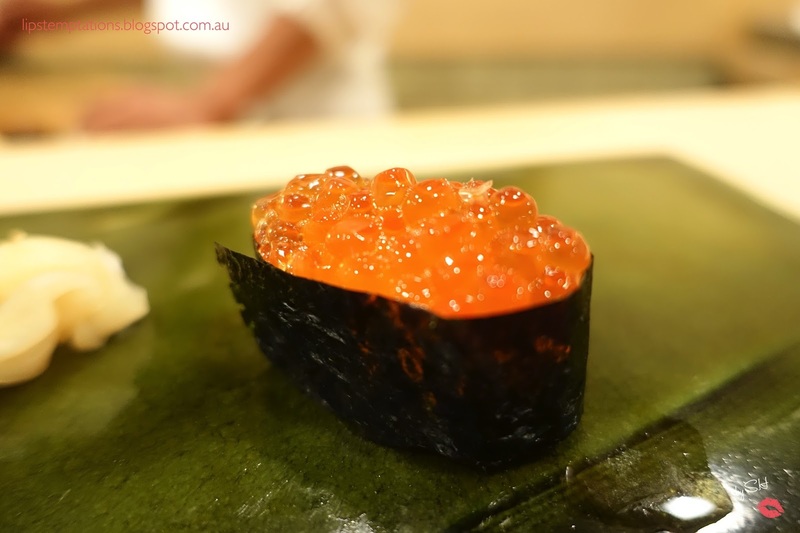 Ikura - Salmon roe sushi. Takashi-Ono explain to us that they actually prepare the Ikura themself, it's a housemade ikura. There is no fishy taste or fishy smell at all. It was delicious and one of my favourite out of all. 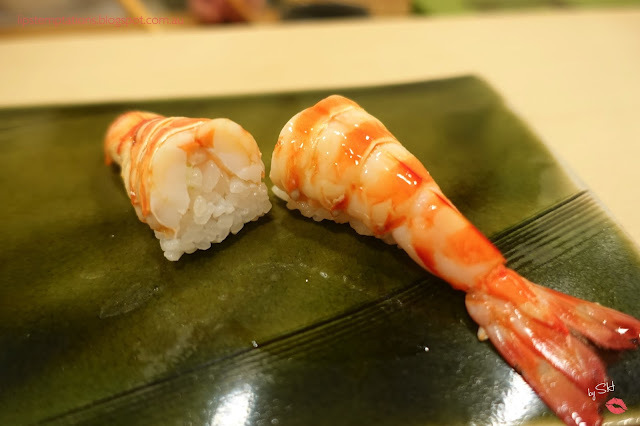 Kuruma Ebi - Japanese Imperial Prawn sushi. 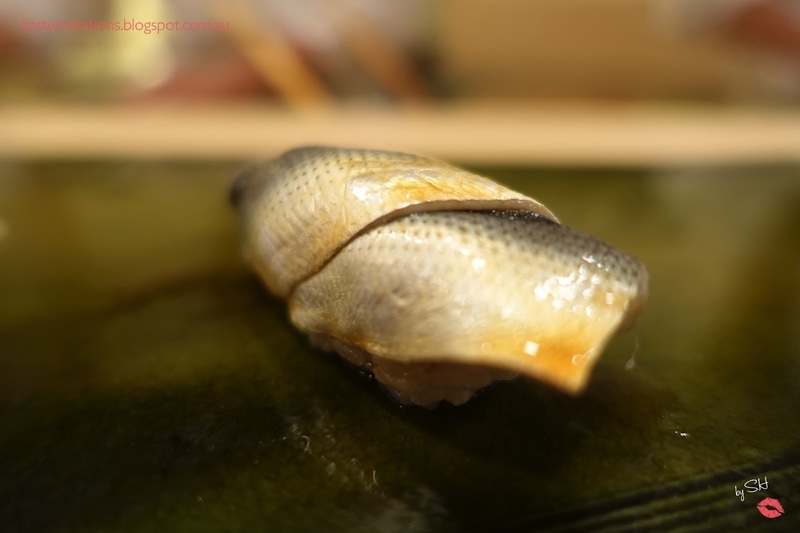 Takashi-Ono explain to us it was killed minuted before, flash boiled than served. He said it was sliced with a technique that the flavour and juices from the head are incorporated with the meat, that's why the head is missing. Takashi-Ono being so nice also told me if I'm too full just eat the tail part and I can give the other part to my partner. Hamaguri - Clam sushi. It was crunchy but not dry. 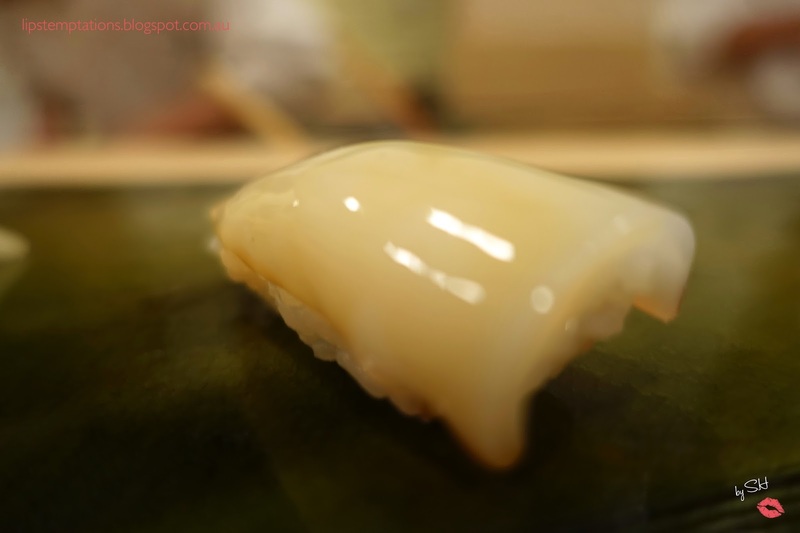 This is the first time I tasted clam sushi and even though it's tasty, I'm not sure I'm going to crave for it. Hamaguri clam is not easy to obtain so this is a treat. Sayori - Halfbeak fish sushi. This is another first for me, I have never tasted halfbeak fish before. 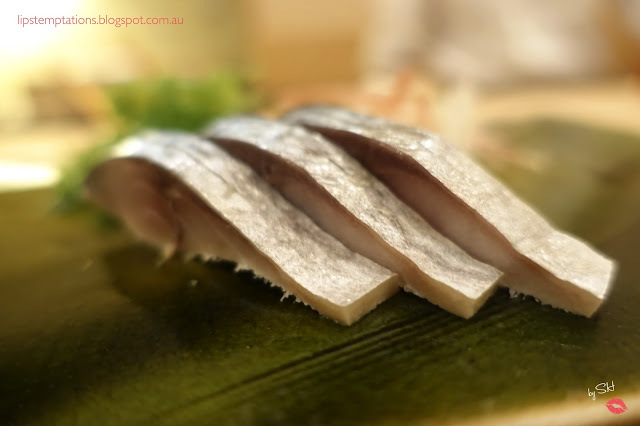 The texture is between firm mackerel and crunchy squid or shellfish. 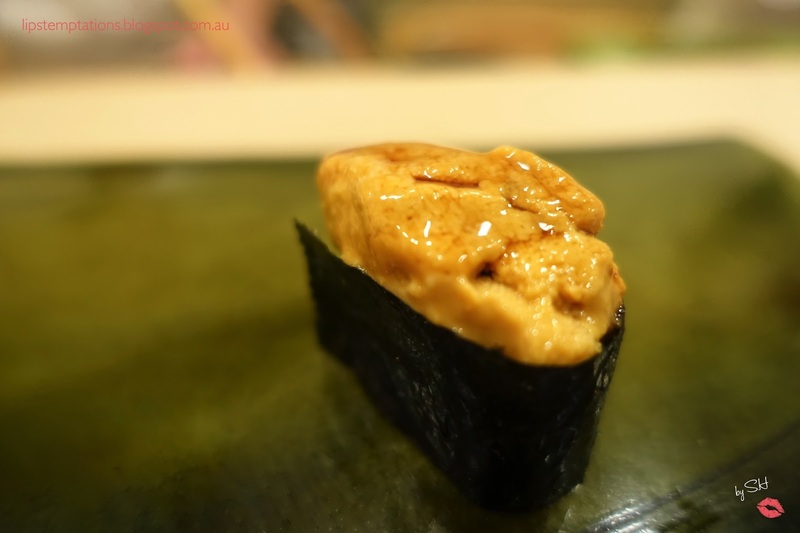 Uni - Sea urchin sushi. This is what I'm waiting for, I'm a big fan of uni and so far Japan is the best place to eat fresh uni. Uni served by Takashi-Ono it was the best uni I ever had. It was firm, sweet, velvety, definitely melt in your mouth moment. He also explains that most uni comes from a canned instead of fresh. 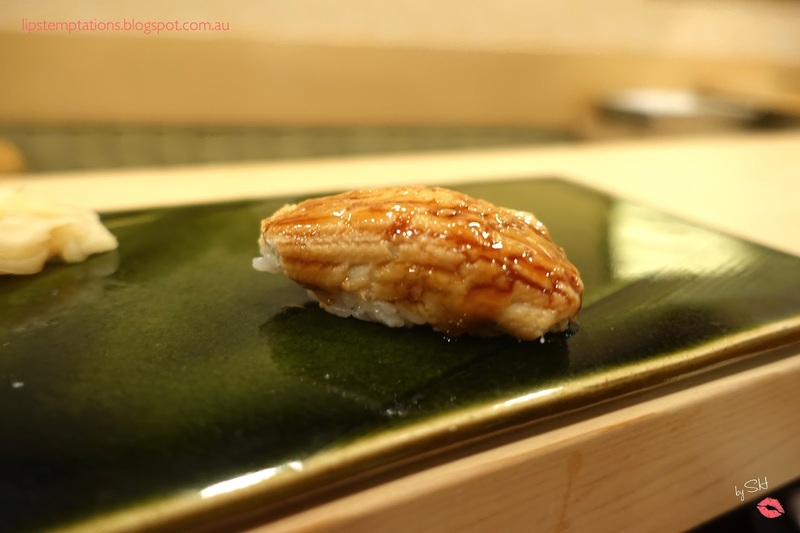 Anago - Sea eels sushi. It was amazingly creamy, soft and delicious with the right amount of sweetness from the sauce. After the amazing sea eels sushi, they offer you one extra sushi of your favourite from the previous dishes or a new sushi. 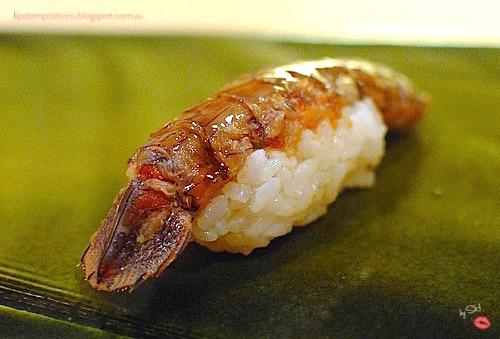 Even though I was beyond full I picked Shako - Mantis Shrimp sushi. Another first for me and it is was dense, meaty and crunchy. 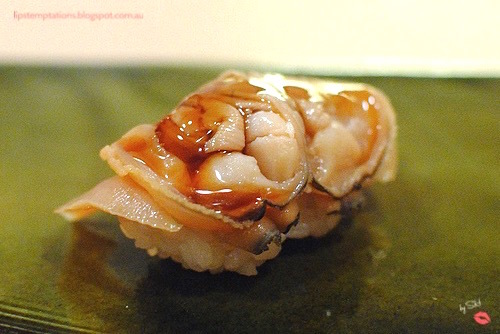 My partner picked Awabi - Abalone sushi. 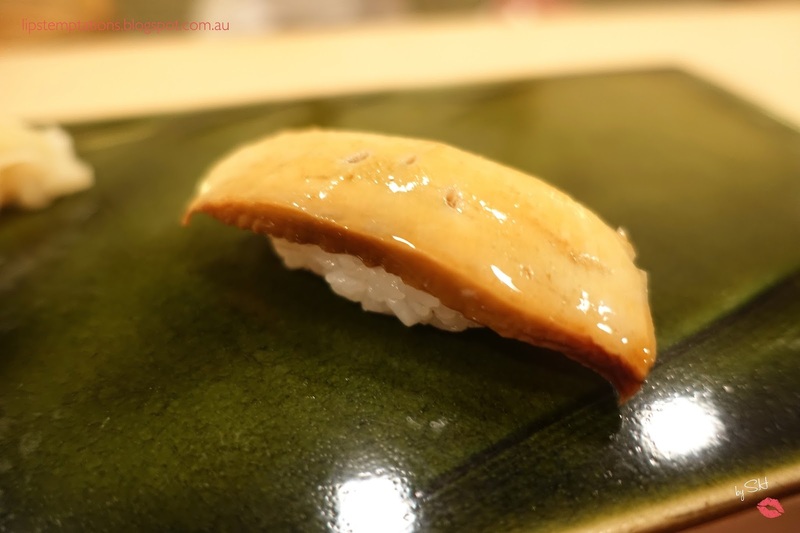 It was tender, tasty, succulent as the finest piece of Abalone in Japan. 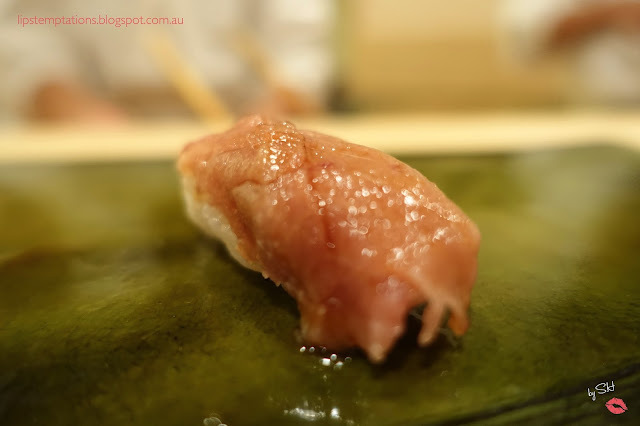 When we finish the previous sushi, they asked us whether we still want for more and we ordered Ootoro - Fatty tuna sushi. These cuts of tuna were the highest quality available and it literally melts in your mouth, it's super delicious. 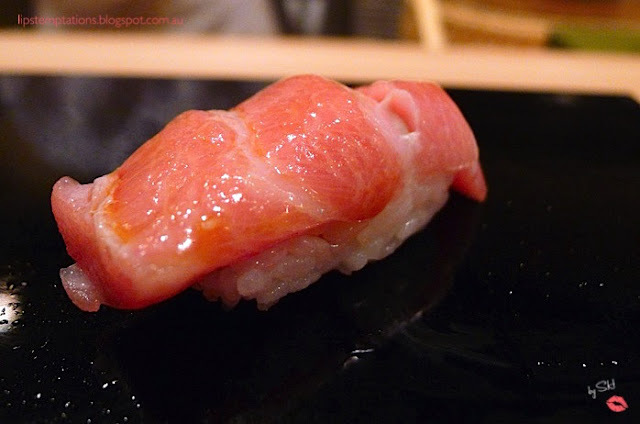 Best ootoro I had in my life. 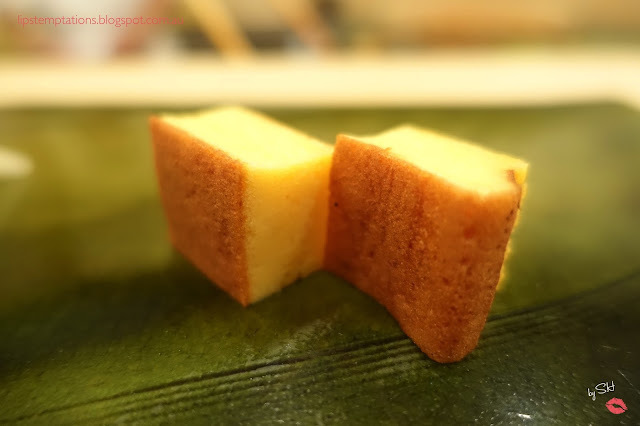 Tamago - Sweet Egg Omelette. The sweet egg had a fluffiness, soft but dense and firm. This is probably the highest quality Tamago I have ever eaten. Dining at Sukiyabashi Jiro forever changed what I thought of sushi. The chefs make a daily journey very early in the morning to the Tsukiji fish market to scour the freshest and best catches of the day. In the kitchen each fish is placed in a special refrigerator with a spesific temperature to ensure the best quality and it clearly showed. 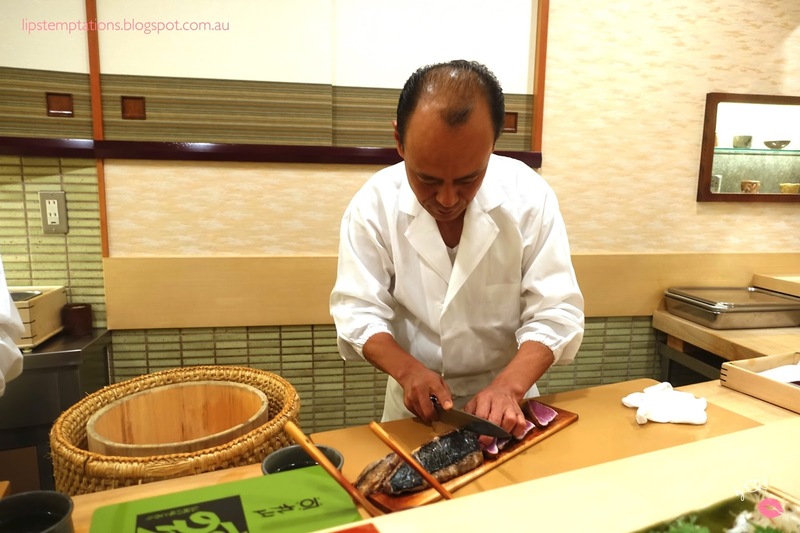 Takashi-Ono timing was impeccable, each fish was served at it's ideal temperature, cut and prepared properly. 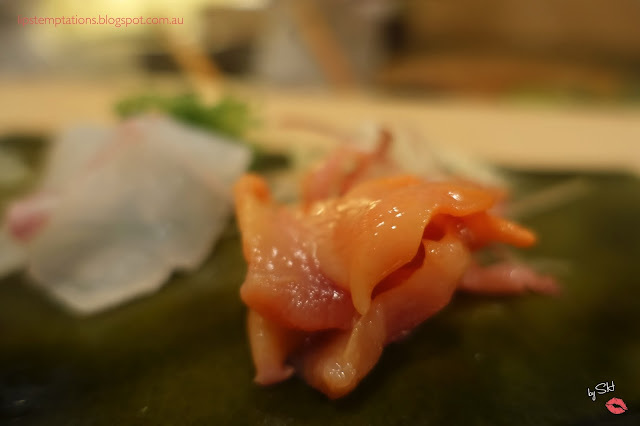 My favourite sushi are Ootoro and Uni, I'm still dreaming about them today. Another thing I notice is they used much more vinegar than the other sushi restaurants and some people finding it too sour. At the end Takashi-Ono take his time and take a picture with everybody and says thank you personally to each customers. Generally the meal last approximately 30 minutes but our last for more than an hour. 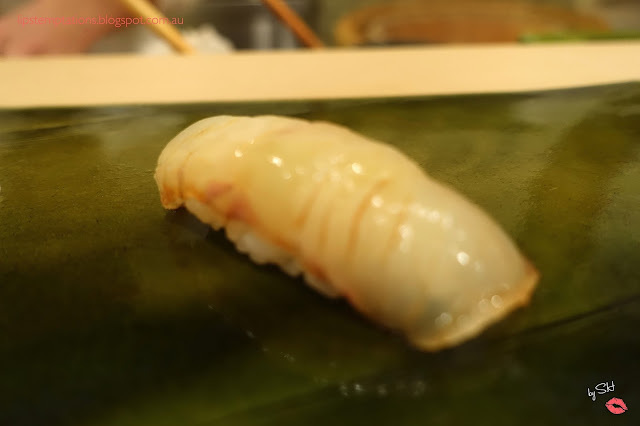 As I expected lunch is very expensive, total cost 55000 yen for 2 people, 27500 yen per person but it is worth your time and money as life is short, why not experienced one of the best sushi place in the world?